Wife’s Odd Strategy is Kicking My @ss!! When it comes to drafting a Fantasy Football team, conventional wisdom says to select the best available player in each round. That makes perfect sense to me and to most of the men out there. Not so much for my wife and possibly for other women playing fantasy football. Tammy’s a rare breed because she loves football, more specifically the NFL version of the sport. She tolerates my watching college football on Saturdays, but on Sundays in the fall she’s watching games all day. Route Trees don't need water. She may not know how to spot a Cover-2 defense, who a “Mike” linebacker is, or what a route tree means, but that doesn’t mean she can’t carry her own in a football discussion. Before each of the past three vacations I purchased multiple fantasy football magazines to have something to read while relaxing on the beach. Because it’s “too early,” Tammy doesn’t even look at them and instead reads up on the latest Hollywood gossip. But every year she’s always ready to play when I “quiz” her by asking her to name the Top 10 players at the QB, RB, WR and TE positions. I haven’t kept up with her stats, but I do know that she’s fairly accurate. Even her incorrect guesses (someone ranked outside of the top 10) don’t miss by much. I can talk about football with her like she’s one of the guys, often discussing topics like who we are going to draft or who we should start/sit each week and why. She reads all of the articles I print out each week, listens to multiple fantasy football podcasts during the week and watches Fantasy Football Now every Sunday morning (10:30 a.m. on ESPN2). I mention all of these things because I want to make sure people understand that Tammy KNOWS football. She isn’t like most of the women out there who like teams because of the city the team plays in, the color of their uniforms or because they think the quarterback is cute. But when it comes to drafting her team, the woman in her takes over the reigns. I currently run two leagues, the League of Justice, started in 2007, and Bizarro Justice, started in 2009. Every year Tammy has had a team in each league and drafts her own team. A few years ago she was going to miss the LoJ draft to attend Jake’s JV intrasquad scrimmage, and wanted me to pick her team. She handed me several sheets of paper and told me to use them instead of the various cheatsheets I had printed from ESPN, CNNSI, CBSSportsline, etc. The next few seconds when something like this. Tammy: Because I marked off the people I don’t want. Tammy: Yes. If they are marked off my list I don’t want you to draft them. 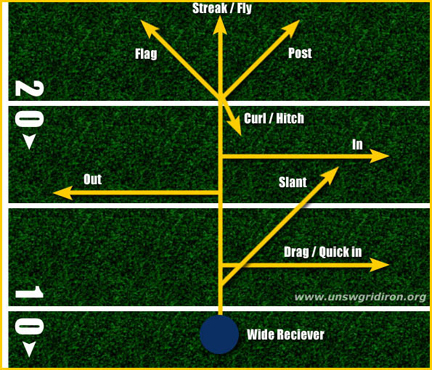 Me: You’ve got Randy Moss marked off. Tammy: I know. I don’t want him. Me: What if he’s the best player available? Tammy: I don’t care. I don’t like him. Don’t get him. Tammy: If you do I’m gonna be so pissed at you. I don’t remember who all ended up on her team, but I followed her instructions and didn’t draft anyone marked off her list. You don’t have to know Tammy personally to know of her obsession with Manning family. 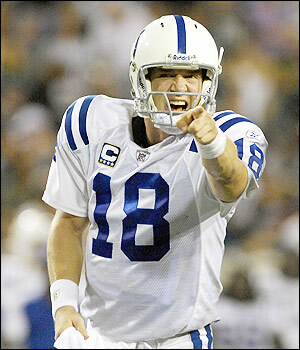 At the top of her list is Peyton, the quarterback for the Indianapolis Colts. He’s NOT pointing at YOU Tammy. I don’t really remember WHEN she fell in love with him but I think it’s a direct result of him being on every other commercial a few years ago. Anytime he’s on the TV she stops moving and stares hypnotically at him. She loves to watch him run because of how his stomach sticks out. She pulled for the Colts to beat the Bears in Super Bowl XLI even though we live less than 90 minutes away from Chicago. She knows his wife had twins during the off-season. One time she was sitting on the couch with her computer in her lap and kept laughing hysterically. Because she had headphones on I couldn’t hear what she was listening to. I wasn’t surprised when she told me she was watching a bunch of home movies from the Mannings that were on YouTube. She watched them for nearly two hours. Not long after Manning movie night she started looking for other areas of his life to dig into. Tammy: I wonder if he’s ever done anything bad. Me: I’m sure he has. Tammy: I don’t know. I better look it up. With that she took to the internet to try and find evidence of Peyton being bad. She showed me a picture from college where he appeared to be drunk and another one from college where he had his shirt off. My friend Daniel and I often tease her about her infatuation with Peyton but Tammy’s always quick to point out just what she’s attracted to. Tammy: He stimulates my mind. She has had a Manning on at least one of her teams in each of the last four years. Even with his current neck issues that could cause him to miss games, she was hoping to have Peyton on ALL of her teams this year but it wasn’t meant to be. Her own son, Jake, took Peyton out of spite in the LoJ draft. She took a player Jake wanted so he decided that if he couldn’t have his player then Mom wasn’t getting hers. Tammy joined me in a third league this year and missed out on Peyton there as well. It’s a live draft (where everyone is sitting in the same room as opposed to an online draft done over the computer) and since she didn’t know all of the people she held her tongue, briefly. After the draft was over, I wasn’t surprised when she let loose because I could still see the smoke coming out of her ears. Tammy: Who’s that b!tch that took Peyton!! The reality of losing out on Manning in the LoJ draft sent Tammy into a little tailspin because it meant she would have to find another quarterback. She decided to get her QB in the later rounds and filled her roster with RBs, WRs and TEs. She started to get concerned when she noticed some of the teams drafting their backup QBs earlier than she anticipated. Tammy: I can’t believe they are picking backup QBs so early. Maybe I need to get one. Me: Yeah, you prolly should. Tammy: Who should I get? Me: You could get Josh Freeman (QB for Tampa Bay). Tammy: I don’t want him. Me: Why? He threw for over 3,400 yards, had 25 TDs, only 9 interceptions and ran for nearly 400 yards. Tammy: That’s great, but I don’t KNOW him. Her last statement pretty much says it all. I explained to her that she should pick the best players regardless of whether or not she likes them, or KNOWS them, but it went on deaf ears. I can understand her not wanting Michael Vick on her team. I can even buy that she doesn’t want guys like Chris Johnson or Marshawn Lynch on her team because they have gold teeth. I got why she didn’t like Randy Moss. Other players Tammy doesn’t like and why. Tom Brady: He reminds me of a high school jock that only dates the popular girls and the kind of guy that divorces his wife because she got FAT. Vick: He still should be receiving further punishment. This is the best I can do to enforce that. Drew Brees: ’cause he beat the Colts last year. Aaron Rodgers: He looks like a creeper with his Orange County Chopper mustache. Yuck. Cam Newton: He’s a liar plus anyone with such perfect and white teeth has to be shady. I thought her drafting that way was just one of her many quirks until I noticed another female making some odd picks as well. 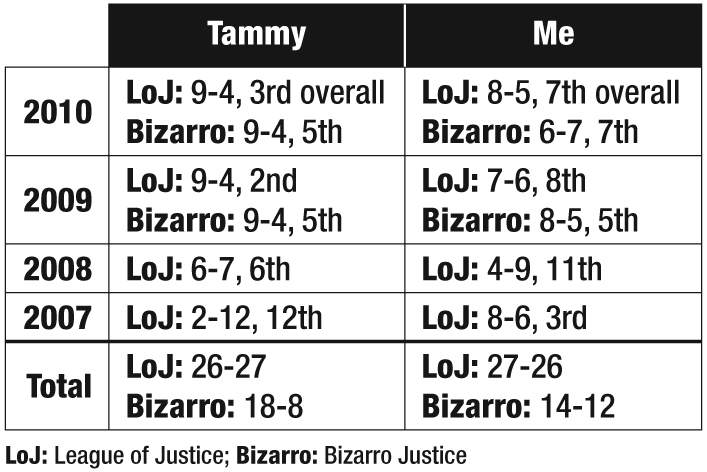 Daniel’s wife, Dana, also a LoJ member since 2007, may have been using the “Tammy Method” all of those years but I never noticed due to all of the craziness during the drafts. This year I noticed that Dana used a couple of her late round picks on players because of where they went to school. Dana graduated from Auburn University and needed to round out her roster with a couple of Tigers in Cam Newton and Ronnie Brown. I told Tammy I was going to write about her unique drafting methods. Her response had me digging in the record books and left me scratching my head. Tammy: What are our records over the past years? Tammy: I bet I’ve done better than you. Imagine my surprise when I looked up our records and found that she’s actually won more games than me. During that time Tammy’s combined record is 44-35 and mine is 41-38. If that wasn’t a big enough kick in the crotch I noticed that in 2007 she lost TWELVE GAMES (2-12) while I finished 8-6. That meant I had been ahead of her by six games. 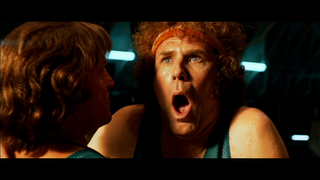 How I felt when I saw our records. Over the last two years all of Tammy’s teams finished 9-4 while I never finished better than 8-5. She finished 2nd in 2009, 3rd in 2010 and no lower than 5th place, which just happens to be my HIGHEST finish. Talk about a punch to the jejunum. We haven’t even played our first game and I’m already looking forward to the 2012 draft so I can draft like a woman and beat her at her own game. Gallery | This entry was posted in Daily Life and tagged 2011, daily life, Draft, Draft Strategies, Draft Strategy, Fantasy Football, FF Draft, Football, Fun, funny, humor, Peyton Manning. Bookmark the permalink. 7 Responses to Wife’s Odd Strategy is Kicking My @ss! !